Sondervorführung zum Internationalen Tag für den Frieden (21. September) zu gedenken und der Internationale Tag zur vollständigen Beseitigung von Kernwaffen (26. September). In der Nacht des 26. September 1983 widersetzte sich Stanislav Petrov dem militärischen Protokoll und verhinderte damit wahrscheinlich ein Atominferno. Er sagt, er sei kein Held: „Ich war nur zur richtigen Zeit am richtigen Ort.” Sie entscheiden! Der Film „The Man Who Saved the World” zeigt diese angespannten Momente des Jahres 1983 als Stanislav die Entscheidung seines Lebens traf. Der Film berichtet auch über seine spektakuläre Reise in die USA , drei Jahrzehnte später. Dort wurde er endlich für seine historische Tat – letzlich die Rettung der Welt – gewürdigt und fand die Kraft, sich mit seiner Vergangenheit zu versöhnen. 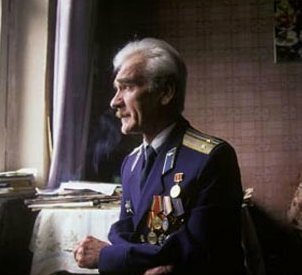 On the night of September 26, 1983, Stanislav Petrov disobeyed military protocol and probably prevented a nuclear holocaust. He says that he is not a hero. ‘I was just in the right place at the right time.’ You decide! For a few crucial minutes on September 26, 1983, Stanislav Petrov held the fate of the world in his hands. It was the height of the Cold War. The Soviets had recently shot down a Korean airliner. The United States was preparing to deploy Pershing II missiles in Europe. The Soviets suspected that the United States was planning a nuclear first strike. In this tense time, a nuclear war was almost started by an error. When an alarm suddenly went off at Soviet nuclear early warning center Serpukhov-15, Stanislav was responsible for reacting to information from Soviet satellites that five American nuclear missiles were heading toward the Soviet Union. Rather than initiate a nuclear retaliation, Stanislav went against protocol, and assured his colleagues that it was a false alarm. He was right. His decision saved the world from a potential devastating nuclear holocaust. But he went unrecognised for this action for decades. ‘The Man Who Saved the World’ recreates those tense moments in 1983 when Stanislav was faced with the decision of his life. And it chronicles his spectacular journey to the United States three decades later, where he was finally acknowledged for his historic deed and found the strength to reconcile with his past. In the film we see him reflecting on the current state of nuclear tensions as he visits a US nuclear missile silo. He is honoured at the United Nations. And he is thanked for his actions by celebrities including Walter Cronkite, Kevin Costner, Robert De Niro, Matt Damon, and Ashton Kutcher. Shot on location in the former Soviet Union and the United States, The Man Who Saved the World shines a light on the continued risks of nuclear weapons today, and the challenge to reject nuclear weapons in order to prevent an unimaginable disaster. ← Welcome in the IALANA Family!